Hi Aspirants, after a short break we are back. We are in a phase of change and will come up with more details soon. 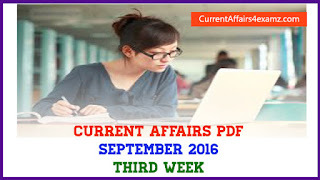 Here are the Important Current Affairs for 11 August 2016 useful for all upcoming competitive exams. 1. Which country on 11 August 2016 launched Gaofen-3 high-resolution radar imaging satellite? Note: China has successfully launched a new high-resolution Synthetic Aperture Radar (SAR) dubbed as Gaofen-3. It was launched from the Taiyuan Satellite Launch Center in northern Shanxi Province on the back of a Long March 4C rocket. 2. Government has introduced the Maternity Benefit Bill in Rajya Sabha on 10 August 2016. The bill seeks to increase maternity leave to ___ weeks from current 12 weeks in all establishments? Note: Once passed, this bill see India among 40 countries where maternity leave is more than 18 weeks. The bill will amend the Maternity Benefit Act, 1961. Currently women working in the private sector are allowed a maternity leave of three months while those in government sector are entitled to a leave of six months. 3. Renowned carnatic vocalist M. S. Subbulakshmi will be honoured at the United Nations on 15 August 2016 by whom? Note: Rahman will become the second Indian artist after Subbulakshmi to perform at the UN. M. S. Subbulakshmi was invited by the then UN Secretary General U Thant to perform at the UN headquarters in 1966. 4. 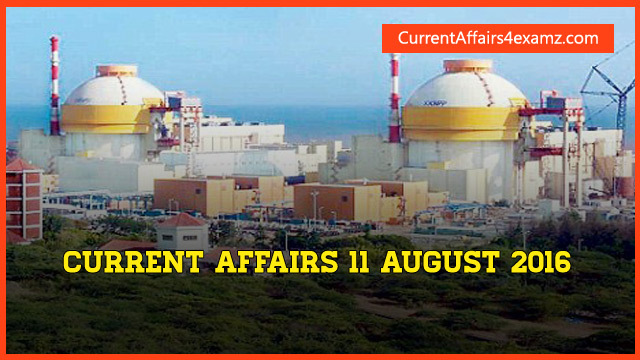 Prime Minister Narendra Modi and Russian President Vladimir Putin on 10 August 2016 dedicated the first unit of the ambitious Kudankulam Nuclear Power Project (KKNPP) in which state to the nation? 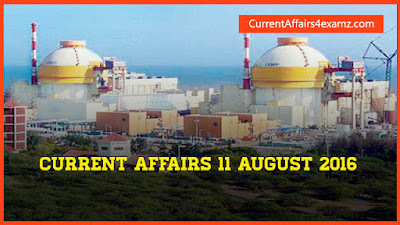 Note: Kudankulam Nuclear Power Project has India’s single largest nuclear generation unit with capacity of 1000 megawatt (MW). It is built under India-Russian Nuclear agreement of 1988. 5. Union Government has decided to set up a committee to look at easing the policy regime for e-commerce players, including the rules for foreign direct investment (FDI). The committee will be headed by whom? Answer: Amitabh Kant, CEO of NITI Aayog. Note: Members in the panel will include officials from Union Commerce Ministry and Industry and Department of electronics and IT among others. 6. Who on 9 August 2016 assumed charge as the Chairman of Central Silk Board, Union Ministry of Textiles for a period of three years? Note: He is the 25th Chairman of the Central Silk Board. 7. Name the Yesteryear Tamil actress who passed away on 9 August 2016 in Chennai? 8. Name the Iron Lady of Manipur who ended her 16-year-long hunger strike for repealing of the Armed Forces (Special Powers) Act (AFSPA) of 1958 from Manipur? Note: She had started hunger-strike at the age of 28 following a massacre in Malom, Imphal in which innocent 10 persons were killed by the Assam Rifles in November 2000. 9. The Reserve Bank of India on 9 August 2016 released its third bi-monthly Monetary Policy Statement 2016-17. What was the Repo Rate? Note: Repo Rate: The policy Repo Rate under the Liquidity Adjustment Facility (LAF) was kept unchanged at 6.5 percent. Reverse Repo Rate: The reverse repo rate under the LAF will remain unchanged at 6.0 percent. Cash Reserve Ratio (CRR): The Cash Reserve Ratio (CRR) of scheduled banks was also kept unchanged at 4.0 percent of Net Demand and Time Liabilities (NDTL). Marginal standing facility (MSF) Rate: The MSF rate was fixed at 7.0 percent. Bank Rate: The Bank Rate also stands at 7.0 percent. 10. Who was appointed as the Managing Director (MD) of State Bank of India (SBI) on 10 August 2016?